vRNI (vRealize Networking Insight) has improved the NSX offering significantly since its release and now, there’s a NSX Pre-Assessment Tool based on it, which is sure to help accelerate deployment of NSX in a target environment. There is also a fair amount of emphasis on Micro-segmentation and helping applications make use of it seamlessly. This has always been a big selling point for NSX and the message continues here. Compliance has always been a big topic for enterprises and government organisations and this version comes with yet more certifications so it can only help with wider adoption of NSX. Inclusion of Linux Guest VM Introspection enhances visibility into guest machines as lots of organisations have a large piece of their infrastructure based on Linux, which was previously missing. Also, scale has increased to cover environments larger than 50K desktops now. One of the things I was waiting most for was support for the new vRealize Automation Suite. 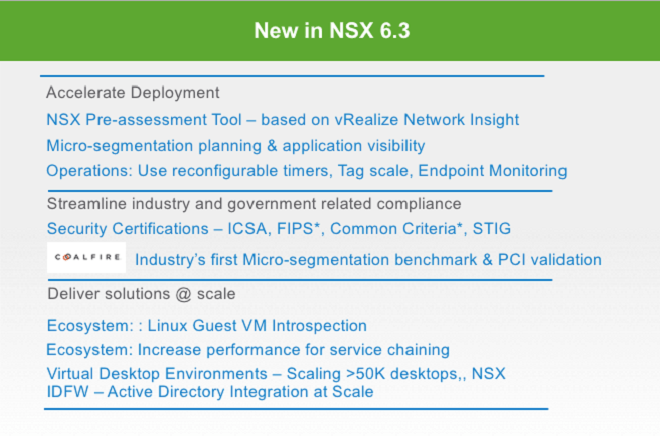 NSX 6.3 delivers that and more. There are enhancements in routing and general operations. Nobody likes reboots during an upgrade and it seems 6.3 and later versions will have less of them! As expected, vRA 7.2 integration is now available and there are enhancements to load-balancing and NAT mechanisms. If you work with a service provider, you will certainly like additional capabilities for vCloud Director 8.2 etc. Plus, there is more integration and support for newer frameworks e.g. VIC (vSphere Integrated Containers) and automation products. As more an more environments focus on DR capabilities for their environments, it’s important that NSX keeps up with requirements in that area too. Gone are the days of having just one private DC in an organisation. Multi-DC environments are quickly becoming the norm which are often multi-platform. Also, an increasing number of companies are looking at having at least a part of it in the public cloud. 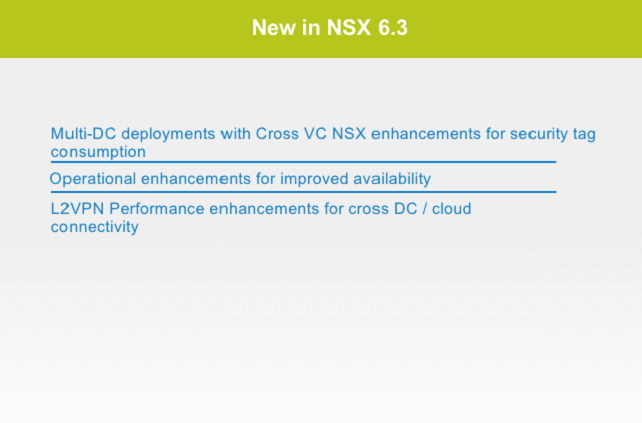 NSX 6.3 has many enhancements that support those requirements and I am sure more will come in the coming releases. In addition to all this, there is now a “Remote & Branch Office” edition. 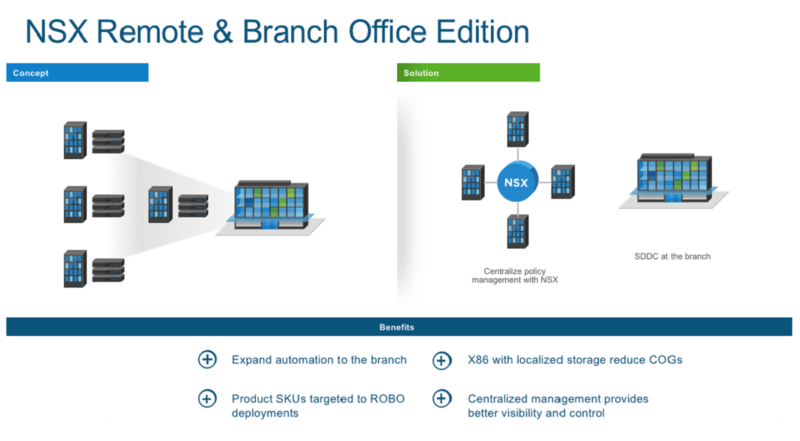 This is really very helpful as in the same way as vSAN, a full-blown version of NSX was an overkill for ROBO (Remote Office, Branch Office) environments and something more suitable was needed. Now extending the benefits of NSX to the smaller offices will be an easy option and will integrate visibility, security, automation and control with the main deployment. 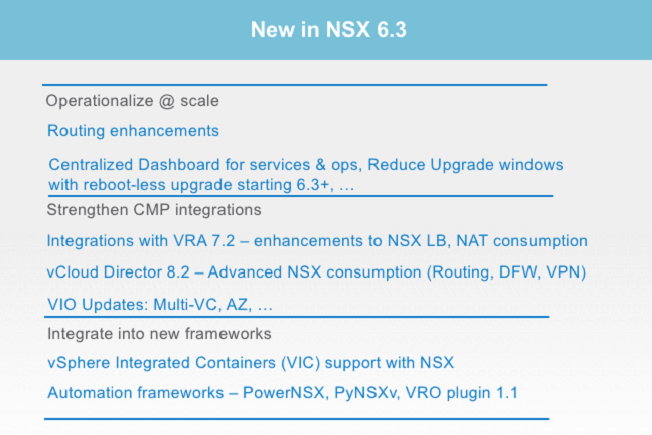 I think a major update to NSX was long overdue and I am glad it has finally come out. My lab was anxiously waiting for it and finally, it can get all the new and shiny vSphere/vRealize upgrades too!